Design your own badge online now. 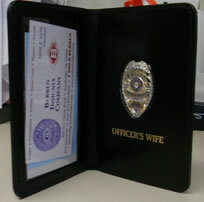 Video: Elyse R. Aion talks about the making of police badges. In order to consistently provide outstanding customer service while protecting customer information, we now accept all orders personally through our convenient toll free number. Let us guarantee your 100% satisfaction. We gladly accept MasterCard and Visa For All Orders!